HoR Deputy head Neweri has called upon the HSC to install Shukri as the new CBL Governor (Photo: Neweri FB page). The First Deputy Head of the House of Representatives (HoR), Fawzi Taher Al-Neweri, has called upon the High State Council (HSC) to urgently install the HoR’s nomination, Mohamed Shukri, in his post in Tripoli as the new Central Bank of Libya (CBL) Governor. 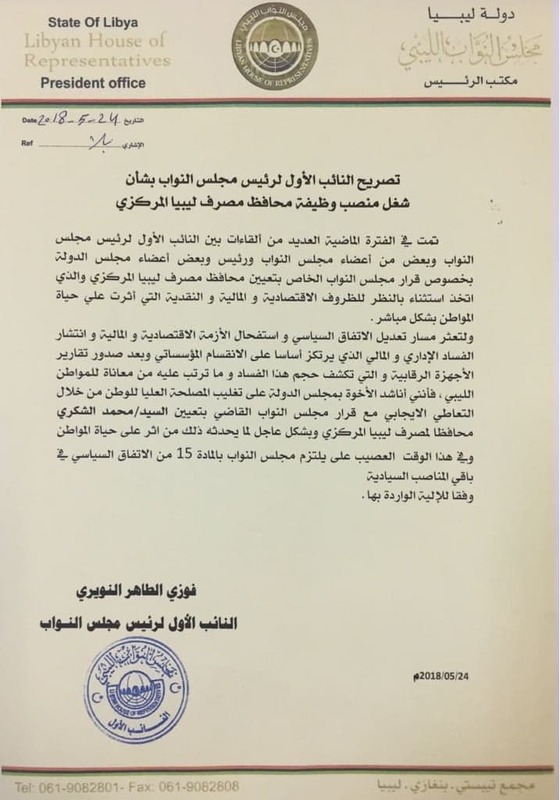 In a statement released today, Neweri said that there had been many meetings held between him, members of the HoR, the head and members of the HSC regarding the HoR’s decision to appoint a new CBL Governor. This decision, Neweri said, was an exceptional decision taken in view of economic, financial and monetary conditions that had (negatively) affected citizens’ lives directly. However, Neweri added, due to the stalling of the Libyan Political Agreement amendment process and the economic and financial crisis, and the widespread administrative and financial corruption, which is based on the institutional division (in the country), and after the release by the monitoring authorities of their reports which reveal the scale of this corruption and its resulting suffering on Libyan citizens, I call on members of the HSC to prioritize the high national interest by dealing urgently and positively with the HoR’s appointment of Shukri as Governor of the CBL. This is especially in view of its effect on the lives of citizens at this difficult time. 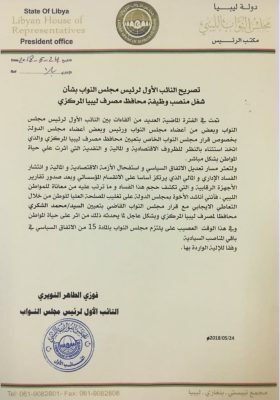 The HoR, Neweri concluded, undertake to uphold article 15 of the Libyan Political Agreement regarding the other sovereign state positions through the agreed process. However, it is thought that the HoR now feels that the new HSC head, Khaled Mishri, is more agreeable to installing Shukri as the new CBL Governor.